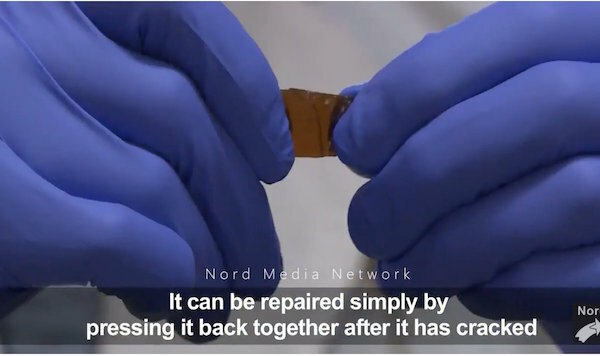 A Japanese researcher has developed — by accident– a new type of glass that can be repaired simply by pressing it back together after it cracks. Yu Yanagisawa, a chemistry researcher at the University of Tokyo, made the breakthrough by chance while investigating adhesives that can be used on wet surfaces. Does this mean you will soon be able to repair those cracks in your smartphone with a quick press of the fingers? Or surreptitiously piece together a shattered beer glass dropped after one pint too many? Well, not quite. Not now and in fact, not in the near future. But it does open a window of opportunity for researchers to explore ways to make more durable, lightweight, glass-like items, like car windows. In a lab demonstration for AFP, Yanagisawa broke a glass sample into two pieces. He then held the cross sections of the two pieces together for about 30 seconds until the glass repaired itself, almost resembling its original form. To demonstrate its strength, he then hung a nearly full bottle of water from the piece of glass — and it stayed intact. The organic glass, made of a substance called polyether thioureas, is closer to acrylic than mineral glass, which is used for tableware and smartphone screens. The secret lies in the thiourea, which uses hydrogen bonding to make the edges of the shattered glass self-adhesive, according to Yanagisawa’s study. But what use is all this if it cannot produce a self-healing smartphone screen? “It is not realistically about fixing what is broken, more about making longer-lasting resin glass,” Yanagisawa told AFP. Glass products can fracture after years of use due to physical stress and fatigue. “When a material breaks, it has already had many tiny scars that have accumulated to result in major destruction,” Yanagisawa said. “What this study showed was a path toward making a safe and long-lasting resin glass”, which is used in a wide range of everyday items. “We may be able to double or triple the lifespan of something that currently lasts for 10 or 20 years”, he said. This app seems really useful and almost sophisticated, in a way. The audio software looks very promising and might give me a break from writing as well. Loving the intro and basic features thanks for sharing.